When he’s not pursing his photography and golf hobbies in his free time, longtime industry professional Dave Johnson, north central region manager for AP&G, is busy with his other creative outlet: crafting hot sauces. Earlier this year, Johnson realized his dream to bring his first pest control industry hot sauce — “Exterminator” Gourmet Hot Sauce — to market. The germ for the idea to create his own hot sauces came to Johnson seven years ago while he was at a restaurant and began scribbling notes on a napkin. Next up was seven years of tinkering with a variety of ingredients, styles and heat levels to perfect his offering. The main ingredients listed on the label are chili peppers and apple cider vinegar — staples of “Louisiana style” hot sauces. Johnson describes Exterminator Gourmet Hot Sauce as a medium hot, full flavor sauce with what he believes to be a winning flavor. “It’s the perfect hot sauce for those occasions when you’re faced with bland-infested food,” he said. To reach the general public, as with many goods, packaging and presentation are key. Johnson and his team created a catchy label featuring a chef (Louie) with a backpack sprayer in tow. “We wanted to have some fun with the label and come up with something that would draw hot sauce label enthusiasts and deliver the quality as well,” he said. 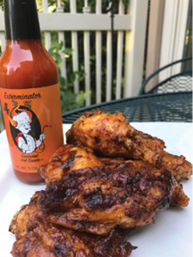 Exterminator Gourmet Hot Sauce giving chicken a flavorful BBQ boost. Exterminator Gourmet Hot Sauce information and marketing updates can be found via social media (Facebook page: J&K Specialty Foods). The products can be ordered from J&K Specialty Foods directly at www.jandkspecialtyfoods.com, or by calling 614/774-3536 (Ann).